I'm starting an official thread for the 5th (?) official chain game. The theme of the latest chain game is Western. We're not doing contemporary again, and we're not going back to fantasy nor into space. This is Western: vagrants, miners, guns, booze, brothel, horses and racial stereotypes (because society was horrible back then, seriously). Anyone who is willing can help out with resources, even if you do not have the time to participate with a chapter. Members of the site can sign up for a chapter, and we'll sort it from there. Give me chapter 2. I rather do a chapter when there is few heroes. Oh btw, Prpl, you missed the second part of those battlers. Thanks so much for those battlers momeka they look great! As for names, I'm working under 'tales from the west' but that's not great as we're likely to have just one tale. I like the names about exploration and discovery as they fit the game as I envisage it so far. What about 'The Heart of Gold?' as that's kinda about a person but also the gold rush that is going on? I'm easy, we could tie it more to the story but I currrently don't have a strong one going on; I'll more likely leave it to the creators of the later chapters to decide. You had the others in the old thread so figured it wasn't needed. This was more to showcase what we were going for in case someone wanted to help out. Chapter three I claim! I will do no latter as I won't have time for my usual shenanigans and I stick to my guns on what I said in J.O. : never again will I do the last chapter unless it's my own project and nobody volunteers. Heart of gold sounds good. My only gripe with it is that it might not be the most search-friendly name. But then again, this is just a chain game so that might not matter too much. I'm not in for the CG this year. I have a lot to do IRL, and I've lacked the will of doing any game related stuff the past few months. I'll play happily though once it's out. Hmm, how about expanding it then? Like "Blood for the blood god and a Heart of Gold"
Sorry to hear that, I hope you'll find the time to participate again in the future. I personally liked where you were going with your last chapter. Feel free to help out with resources if you find the inspiration. 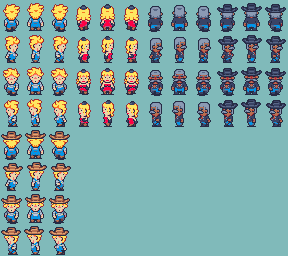 Speaking of resources, started doing some NPCs, mostly inspired by other games so kinda easter eggy I guess. Will post when I got a whole set complete. The only problem with "Heart of Gold" is it is also the name of a famous starship. Not a big problem though as I think I'm the only one to point it out. THAT was it! I knew I'd heard it somewhere before! Hitchikers of course. Lol Yeah I think it will be. Hitchers stuff is always cult popular but even I didn't see it till I read a few posts here and that large,long running shoe, or tea cup, popped into my mind as if the infinite improbability drive had been triggered. Oh another thing is this set more along the lines of 1860 or upwards of 1890? Sort of curious as it determines how much tech was availieat the time. Character I'm designing as a party member is a would be inventor and I was thinking of going the route of Edward from FF6 with how each gadget allows him a new skill. Only instead of purchasing maybe putting a work bench in a hub town or just a key item like "Drawing Board"
Intresting that you're designing a character when you haven't even played the first two parts ; p What if the game doesn't suit having a new character appear? As for the technology available this is going to be fairly loose; it's got monsters and magic so it's hardly historically accurate. Steampunky tech would probably be most appropriate. Well if the character doesn't fit, unlikely as the persona is moldable and the role is almost as versatile as Rool was in J.O., I will look at one of the other four including a boss I could make redeemable as a playable chara. I never design just one party character. There were two versions of "The Mayor" in SV including one where Naomi was a man. I can also design on the fly like I did with Jazel and Rivet. Both were done in the chapter because I said "why not?" in the middle of doing the chapter. Rivet was a sketch at least I mean but Jazel? I just decided as the party beat yhe boss battle that Jazel would stay behind. I latter realized I skipped over the drama of her being a spy XD That woulda been so funny and fleshed her out better than goddess bimbo healer. XD But yeah you get my drift. I always have a back up plan. So we can tea punk it up? Good. I dont need to edit my metal jowled and armed man. Still got me s possible antagonist/playable if my inventor falls through. Almost done with that charset, been busy with some other stuff lately and haven't really found the drive to finish them. Hey, I've been doing a lot of work on this and it's coming along quite nicely - I've gotten really into making chipsets and stuff. Nice to hear about the charset! 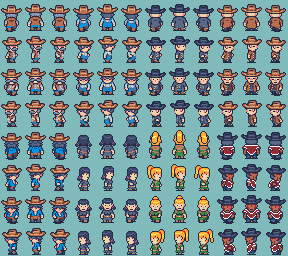 I have made a couple more npcs based on momeka's, but I could use a bit more variety for sure.